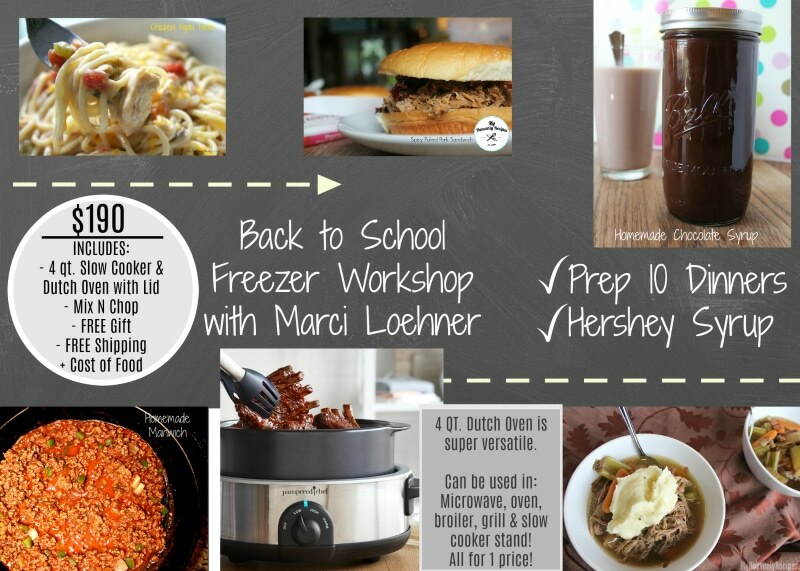 It’s time to get ready for a Back to School Freezer Meal Workshop. You’ll leave with 10 recipes and Homemade Chocolate Syrup your kids will want to get out of bed for! 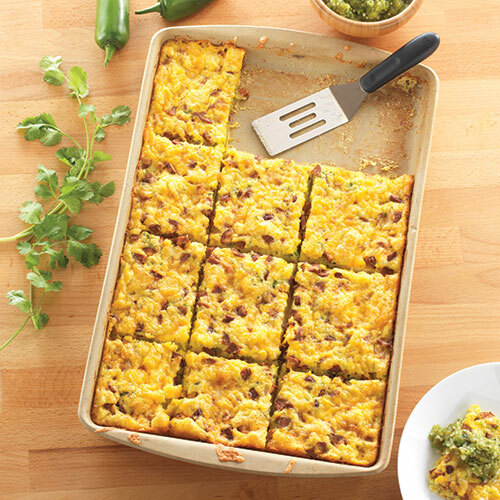 Are you ready to create 10 recipes for your family in under an hour? If so, let’s do this thing as spaces are limited to 6 at this time so you’ll want to RSVP by emailing me at [email protected] ASAP. We will be prepping 10 meals and making your own Hershey Syrup (it’ll get the kids outta bed!). You’ll have all of this prepped in under 1 hour and go home with a freezer full of meals and NEW Pampered Chef products to help you get the job done in a timely manner. 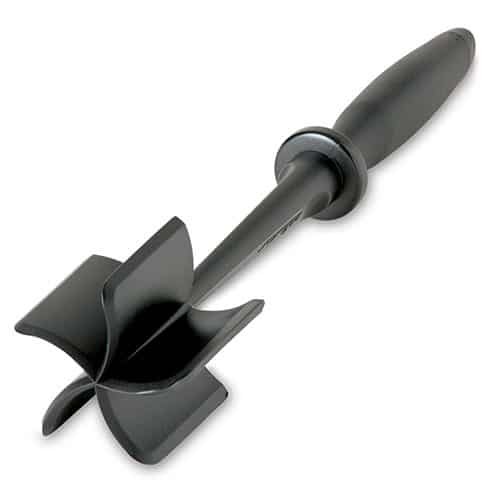 How Does a Freezer Meal Workshop Work? This is a great question! This Workshop is focusing on preparing dinners ahead of time that don’t require much fuss when it comes to cooking time. With the RockCrok 4 qt. 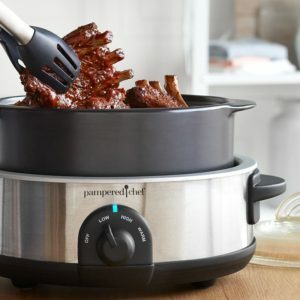 Slow Cooker Set you can cook my Pot Roast, Crock Pot Chicken & Dumplings, Chicken Fajita Pasta and Adobo Pulled Pork while you are at work and running the kids around. Now on those busy nights when you don’t have much time, but, need a quick and healthy meal you can pull out the Manwich the night before to thaw in the refrigerator. Come dinner time the next day you can simply heat it up in the microwave, throw some veggies and fruit on a plate and within minutes, dinner is done! A Mix N Chop from Pampered Chef. Plus, I will provide you with your grocery list to prep all of your meals! My Family Is Picky! What Ingredients Do I Buy? You can click on each recipe to find out the ingredients. If your family won’t eat a particular recipe let me know and we can work around it or find you a new recipe all together! I Can’t Make This Workshop, Will There Be Others? In short, the answer is YES! I plan on doing a Freezer Workshop once a month. So far my tentative dates for 2017 are August 12, September 9, October 15 and November 5. I’m NOT Local. Can I Still Participate? Of course you can! You’ll still be able to receive the same offer for all 3 products and I’ll still pay shipping to your house! I will also provide you with instructions on what needs to be done to prep each meal. I’ll also include my Homemade Hershey Syrup Recipe for FREE so that you can make your own batch. If you’d like to host your own Freezer Workshop contact me (info below) and we will get you all set up! I Want In! What Do I Need To Do? Great! I’m so excited you are ready to participate in the Freezer Workshop. Send me a email at [email protected], call/text me at 513-293-0617 or message me on Facebook. I will give you a link to place your order or you can call me and I can take your order over the phone. Once I see your order come through I will credit your shipping, adjust your total and you’ll have your new Pampered Chef products on the way!